Join us at the Blue Quill Angler for our Double Haul Clinic. The clinic is designed for those looking to up their casting game, whether it’s a tune-up for an upcoming saltwater adventure, preparation for throwing big streamers this fall, or for those looking to become a better fly caster in general! We encourage you to bring your own equipment (6wt through 9wt rods are ideal), however we are happy to provide equipment with advanced notice. Our instructor, Jeff Lefebvre, grew up on the coast of New Hampshire and has been fishing in the salt for over 30 years. 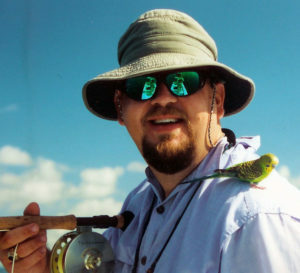 Jeff has been teaching fly casting professionally for 25 years and has even taught classes alongside Lefty Kreh, one of the all-time great fly casters. Jeff will be using many of Lefty’s teaching methods to help you become a better fly caster. The idea of the class is learning not only how to perform the double haul cast, but to truly understand the dynamics of the fly cast and how to diagnose just about any casting problem or challenge as as a result. Jeff will teach you to cast efficiently from a boat deck in order to get the fly in front of the fish with as few false casts as possible. Jeff will also cover the strip-set and you will definitely come away from this class a better fly caster. This class is limited to 6 students and the cost is $75/per person. You can sign up online or call our shop at (303) 674-4700.